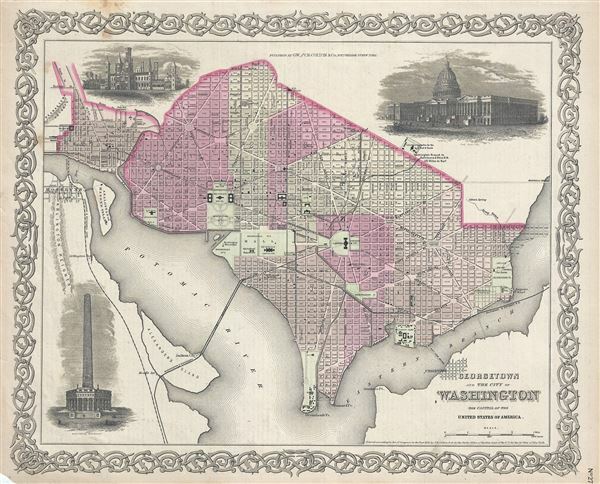 1856 Colton Map or Plan of Washington D.C.
A beautiful 1856 example of Colton's map of Washington D.C. and Georgetown. Like most of Colton's state maps, this map was derived from an earlier wall map of North America produced by Colton and D. Griffing Johnson. Covers the city in incredible detain from Georgetown (Georgetown University, then college) in the upper left quadrant and Rosslyn to Alexander's Island in the south and east as far as Magazine Warf. The map is a lithographic engraving covering the nation's capital shortly before the outbreak of the American Civil War. Notes numerous important buildings including the Capitol, the Smithsonian Institution, the White House (not yet called the White House), the Washington Monument, the National Observatory, the Navel Yard, the Poor House, the Arsenal, Penitentiary and others. Very good. Minor spotting at places, especially over top left margin.